Driver SweeperHow to use ? 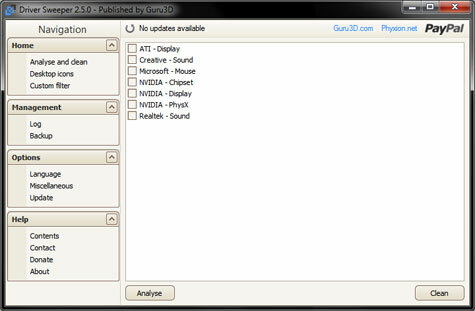 Guru3D - Driver Sweeper is very easy to use. You only have to select the drivers you want to clean. The best way to clean drivers is to first uninstall the drivers using the official uninstallers, reboot in Safe Mode and run Guru3D - Driver Sweeper. However, rebooting and not going into Safe Mode also works, but can cause some files not to be cleaned. The current supported drivers are NVIDIA (Display and Chipset), ATI (Display), Creative (Sound), Ageia (PhysX), MMouse and Realtek (Sound). All the settings are saved in an ini file. Nothing is created in the registry, so it's possible to use it as a portable program. Log files can be saved to the harddisk and viewed as well. You can find the logs under the Tools menu.